Cat Ear Mites - How To Get Rid of Them? Cat Ear Mites – How To Get Rid of Them? Both dog and cat ear mites infestations are caused by the same bug. They are very small parasites that resemble ticks when viewed under a microscope. Ear mites burrow their way into the ear canal where they will begin to thrive on your pet’s ear wax and skin oils. Just like any other organism, as ear mites feed they give off waste products. It’s these waste products that cause the most discomfort to a cat suffering from ear mites in cats. They contain irritating compounds and bacteria that lead to inflammation and subsequent feline ear infections. The most common way to diagnose a case of cat ear mites is by examining the discharge from your pet’s ear. An infested animal will have a coffee ground like discharge with lots of wax and, in advanced cases, will show irritation in the area of the ears. This irritation can even cause feline hair loss. The discharge should be examined under a microscope to confirm the presence of cat ear mites since many ear infections are mistaken as an ear mite infestation. Because the ear mite is only seen as a tiny white speck with the naked eye, they may be near impossible to identify in infested cat ear mite discharge. 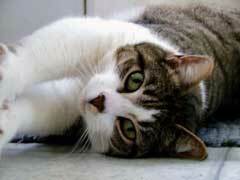 Cat ear mites can be treated in a number of ways. An important thing to remember when treating a pet for ear mites, though, is to treat all of the pets in the house. Ear mites are super contagious among cats and dogs and there is a chance of reinfection by your cat’s house mates. A number of treatments for ear mites in cats are commercially available along with some treatments that are only available by prescription. The use of any of these treatments on a case of ear mites in kittens should only be done with approval from your vet. Depending on budget and how much time you have to give to treatment, there are a few main choices. Topical ointments are readily available at low cost, but they can require daily dosage for up to three weeks. Injections can be obtained from your vet. These often eradicate infections with a few treatments. Injections can be expensive, though, and you will need to do them yourself. There are a small number of single dose treatments, but they are very expensive and your vet may take issue with the use of these powerful medications. Most importantly you should be sure the infestation is gone and be sure it is ear mites before beginning treatment.